When I first saw the announcement for Die for Valhalla! I just had to play this game. Having received the review code I dived right into it and explored the Viking lore to see what Valhalla really is about. There are two main modes to choose from, either dive right into the story-mode alone or tag in another player at any given time, or challenge your friend(s) to a direct duel all in the name of glory. In the game you follow the adventures of the Valkyrie of your choosing, each one named after the four seasons, and their heroes as they travel through the realms, beating enemies and smashing their way through the levels. Die for Valhalla! features plenty of little cut-scenes that are beautifully rendered and riddled with fourth-dimension-shattering jokes and japes. Jump into a level, wipe out your enemies, listen to the little conversations going on, and duke it out again in the next level. 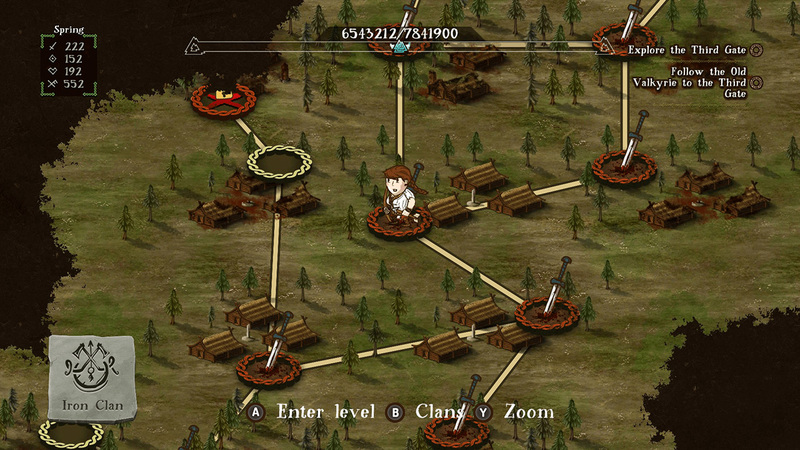 These levels are connected by an overworld from where you can pick and choose any unlocked level to advance or replay. 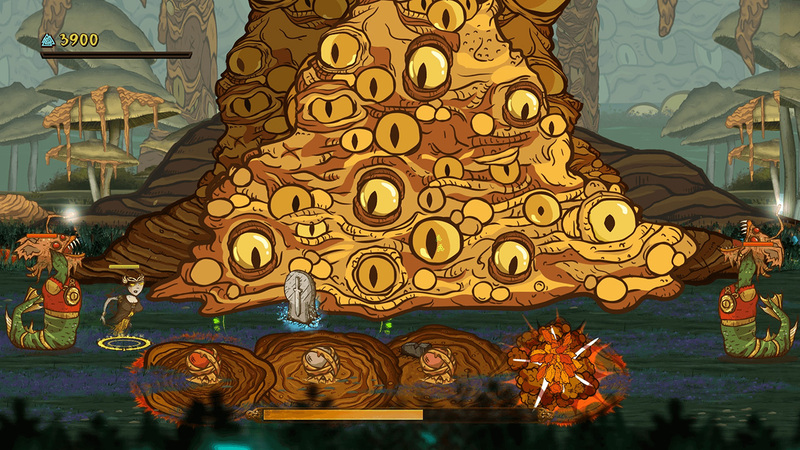 At first, the levels seem interesting with their characteristic cartoony style, interactive elements you can smash apart or possess, and zone-moving while the background parallaxes. This, however, tends to get very repetitive as the overall scenery doesn’t change much during the playthrough of the game, something that is reflected in the enemies you come across, which at first seem to be varied quite much, but in the end feel like a shortlisted version of what could have been. This is furthermore felt when looking at the different Viking clans, which, apart from their own statistical feats, could have been so much more varied to really stress the point that those are actually different clans altogether. It seems the developer was aware of the repetitiveness during game development as during one cut-scene the hero is told to hang in there and keep at it – a fun little pun that proved true. The majority of the levels are decently balanced, while the boss-battles in particular feel overly stretched. Whereas back in the days a boss battle meant countless hours of practicing to study the attack patterns and find weak spots, today’s games tend to lower the difficulty and lengthen the battle, and that is exactly what is at play here. While generally weak and predictable, save from the final boss-battle which is tough as nails, bosses come with their slew of subordinates, some acting as healers, others trapping you or outright frustrating you as you keep being diverted from your target. The controls are very responsive and feel fine on the whole. A thing that did bother me though, was the fact that one has to keep tapping the button to summon a hero, something that could otherwise have been a long-button-press, or a simple double-tap. Though a small thing, in this game you should be prepared to die and die a lot, so you will be tapping that button quite a few times more than you would want to. Even if you don’t die at the hands of an enemy, but rather want to change up your fighting style by swapping out a hero, you’ll be raising a headstone and will need to summon another hero. Be mindful though, because in doing so you will lose all of your picked-up power-ups that you have been carrying over since the last time you summoned a hero to your cause. During most of my run-through, I employed the services of a hunter to keep a safe distance from my enemies using my arrows, all the while laying out traps for them. At other times there is a definite benefit of calling on an all-out melee unit. Apart from the tons of killing, there is plenty to collect unlock in this game. 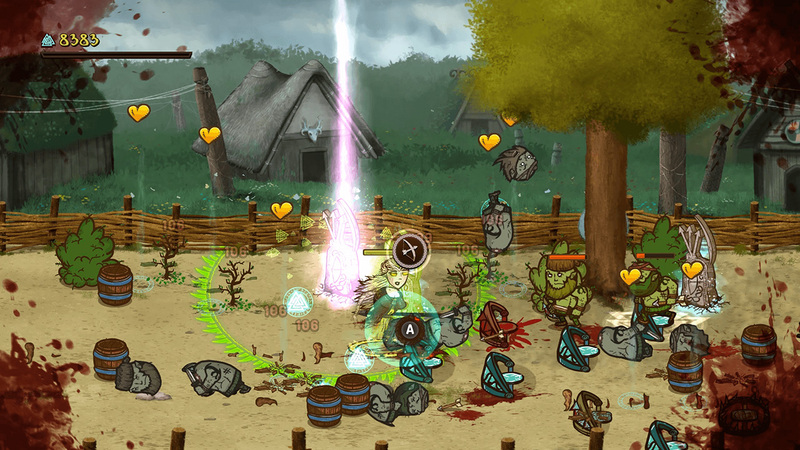 Run through enemies and collect the power-ups and glory orbs sprinkling the ground. 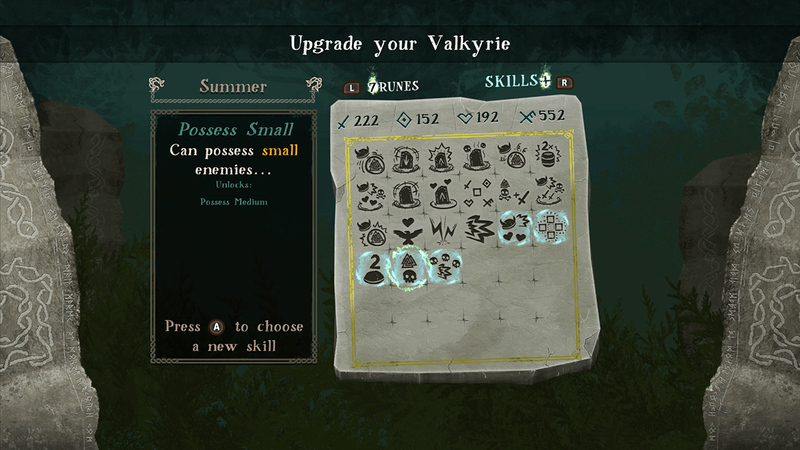 Level up and choose a skill to add to your collection and improve your stats by dashing across the rune board. 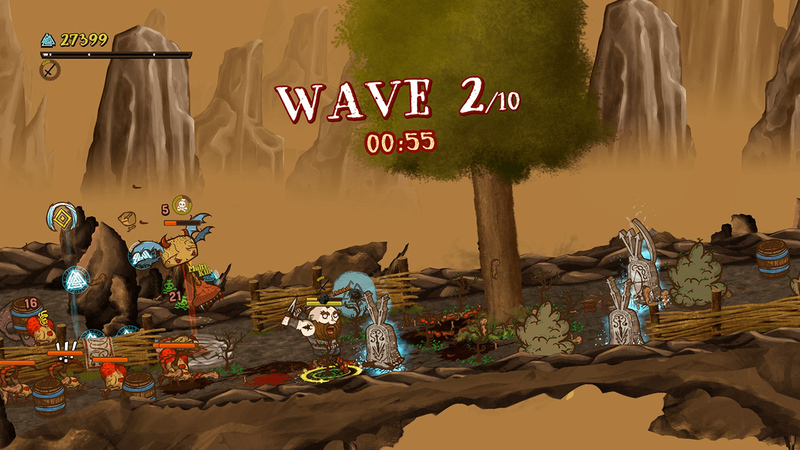 This all in an effort to empower your Valkyrie to take on more powerful and numerous enemies. This game has been designed with co-op mode in mind and while playing well with quick tagging in and having fun while raking up the kills alongside your buddy, there is a crucial weakness in this system. 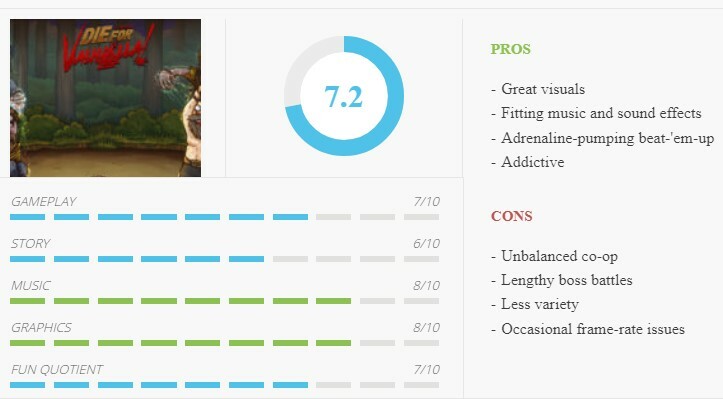 During my first play-through, I went full-on with the Spring Valkyrie and being just a few battles away from the game’s climax I decided to tag in a friend to help out, only to find out that our skill-set and most importantly our Valkyrie’s statistics were miles apart. This, of course, resulted in a very unbalanced fight. Should you go at it together, then be advised to do so from the start, or train multiple Valkyries solo. After finishing the game and starting a new story, I found out that the unlocked clans are carried over. This is a very welcome feature as much as it is an incentive to keep playing this game over and over, till the point of frustration and beyond, till at long last all Viking clans are united and willing to fight for your cause. 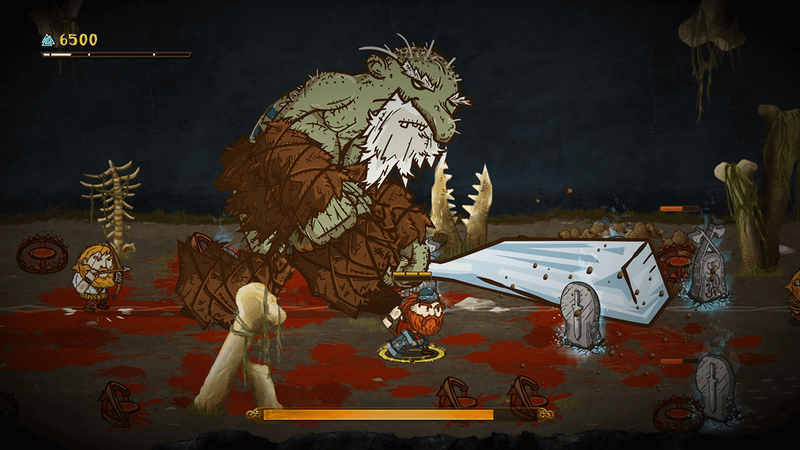 Visually the game is impressive although it suffers from some frame-drops and even an occasional pause when things get heated up, especially after blowing your horn summoning your little Viking buddies. It’s an unfortunate issue as it puts a stop to the fighting when you’re eager to turn things up a notch. Playing for most of the time in handheld mode I was sure this was an issue that would be resolved by docking it, but I was sadly proven wrong. I sincerely hope a patch will be rolled out soon to remedy this. Personally, I really like the art style and it was this which initially drew me toward the game when first I laid eyes on it. The music running in the background feels right in place with its soothing, then epic tunes. The sound effects are on the dot whit screaming Vikings once being sent to the grave, grinning bearded warriors when summoned to fight once more, and all the effects one can expect using all the weapons in your arsenal, topped off with glory orbs raining down on you as you clear up the stage. Die for Valhalla! is a game which I look back on with mixed feelings. It looks and sounds fantastic, it plays very well, makes you smile and it definitely keeps your adrenaline pumping as you hack your way through dozens of baddies. At the same time, it can be utterly frustrating reiterating your limited skill-set in the numerous levels and trying to slay those bosses. 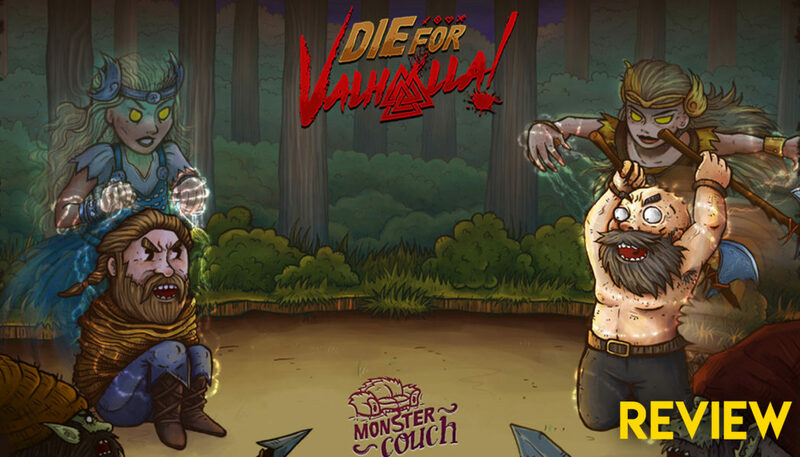 If you love your beat-’em-ups and haven’t got your fill of hits like River City Ransom, Golden Axe, and Streets of Rage, then this is a nice addition to your Nintendo Switch collection and you would do well to put your Viking’s helmet on and grab a copy of Die for Valhalla! Grrr!